Sometimes it’s a challenge to find foods that fit the No Six diet (no: dairy, wheat, eggs, fish, soy or peanuts) I’m on for Baby A. Luckily, I have a forever patient husband who is willing to search things out. 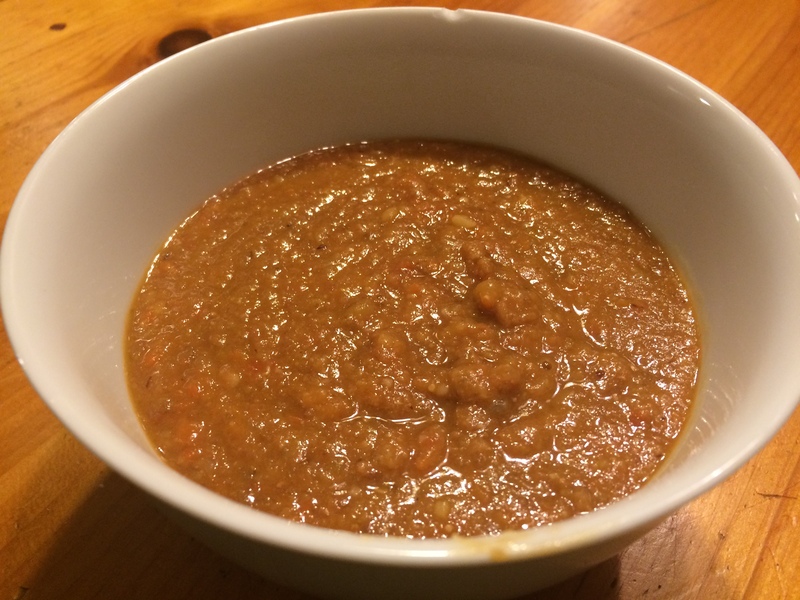 He found this wonderful French Lentil Soup recipe, originally from Bon Appetit and with a few tweaks, it was wonderful. Heat bacon in heavy large saucepan over medium-high heat. Leave the bacon grease in the pan and add the olive oil. Add onions, celery, carrots, and garlic. Sauté until vegetables begin to brown, about 15 minutes. Add 4 cups stock, lentils and tomatoes with juice and bring to boil. Reduce heat to medium–low, cover, and simmer until lentils are tender, about 35 minutes. Using a stick blender, puree the soup until smooth. Season with salt, pepper and the Balsamic vinegar. Like any good soup, this isn’t much to look at, but it is delicious. It is hearty and filling and all around wonderful. I can’t wait to be able to eat warm pita with it!